When looking at yearly forecasts, there are several cycles to consider, including Pinnacles, Transits, Period Cycles, and the lesser known cycles such as Age Digits and the Magi cycle. However, none of these are as strongly felt as the Personal Year and Essence cycles. Your Personal Year cycle runs parallel with the calendar year, from January through December. It alternates in chronological order from 1 through 9 before starting over, each number lasting for exactly one year. Your Essence cycle is derived from the letters in your name and lasts from birthday to birthday. Essence cycles can run from one year to eighteen years or anything in between. They do not run in chronological order, but rather jump from any one number to another. You can have an Essence cycle of 7 for the next three years, then switch to a 3 Essence for six years, then a 1 for one year, and so forth, as they track the letters in your name. Personal Years feel external, while Essence cycles are internal. Understanding this is crucial and greatly influences the way a chart is read. The Personal Year is affected largely by the changing circumstances around you: events that happen to you, people coming into your life, and so forth. Although Personal Years have a big impact on you as an individual, that impact is caused almost exclusively by what happens outside of you. Essence cycles work the opposite way; they affect how you feel, your state of mind, your attitude, your sense of optimism or pessimism, your ambition or lack of it, etc. In other words, while the Personal Year cycles work from the outside in, the Essence cycles work from the inside out. The orderly rhythm of Personal Years, like the bass in a musical piece, carries the more complex and varied composition of your Essence cycles. The sound they make together is what matters. This is where you want to find harmony. 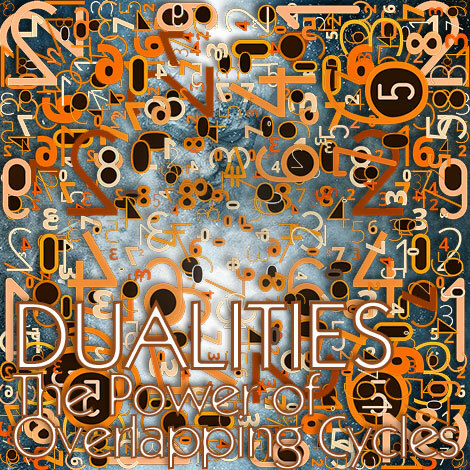 Dualities describe the effect of the two cycles at play - how they interact, and how that interaction alters their influence in subtle and not so subtle ways. This helps you find the balance and synchronization you need to get the most out your present cycle(s). For example, if you are in a 1 Personal Year and your Essence is 7, your Duality is 1 and 7. The 1’s need to push forward ambitiously is greatly tempered by the withdrawn, slow but deliberate influence of the 7. But if your Essence cycle changes to an 8 on your birthday, say in May of the same year, your Duality becomes 1 and 8 – a completely different forecast. Now the driven energy of your 1 Personal Year is supported and enhanced by an almost equally driven and goal-oriented 8. The influence of your 1 Personal Year changes from being restrained by the 7 to being empowered by the 8. The same Personal Year, yet two completely different influences. The importance of the Dualities can’t be overestimated, which is why I spent the better part of a year adding Dualities to the yearly forecast. You can view sample Dualities and how they are used in your forecast here. There are eighty-one Dualities, beginning with a 1 Personal Year and 1 Essence, then 1 Personal Year and 2 Essence, and so on, up to a 9 Personal Year during a 9 Essence. Dualities are the most telling of any aspect in your progressive chart. You can have two or three Dualities during any 12-month period. See the chart below.